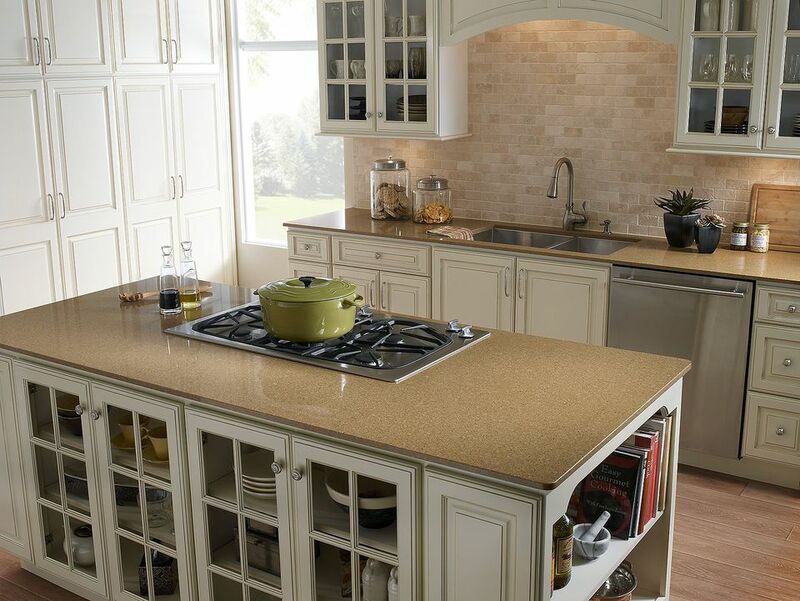 Solid surface countertops provided an option to natural stone countertops in allowing the use of undermount sinks. The design flexibility and durability of these countertops have helped to create some of the most beautiful kitchens and bathroom vanities you will ever see. Although solid surface counters are generally durable, they can still scratch, stain or even crack. Of these problems, repairing a cracked solid surface countertop is the one that strikes fear into the hearts of many do-it-yourselfers. For years, there has been so much “technical” advice and hype about the difficulty of doing solid surface repairs correctly that a quality repair can seem impossible to the average do-it-yourselfer. And horror stories abound about professional contractors charging large sums for such repairs because they require so much specialized know-how. So it can be a horrible feeling when you see a crack or other major damage in your new expensive countertop. To find the materials you need to repair your countertops and a see a variety of new solid surface countertop options you can visit your big box home improvement center, such as Home Depot. Although there are other methods for patching cracked solid surface counters, including buying the professional seaming kit used by fabricators, or routing out the damaged area and gluing in a patch, these methods require materials, tools, and skills that most do-it-yourselfers don’t own, have access to, or know how to use. The two solid-surfacing crack repair methods described in this tutorial are low risk, and it's easy to try again if they don't work out perfectly the first time. This method uses cyanoacrylate (or super glue) and comes from Ken Dolph who is associated with a company called Art Specialties International, an online supplier of Corian® brand remnants, fillers and adhesives. This "super glue" method works best for hairline cracks, narrower than the thickness of a few sheets of paper. Lay bags of ice over the cracked countertop surface, extending at least 6 inches. past the crack on either side. Chill the surface for at least 45 minutes. The crack should widen slightly as the material contracts from the cold. Clean out the crack with a toothbrush and hydrogen peroxide. If dark stains persist in the crack, apply a chlorinated detergent and scrub with the brush. Rinse with isopropyl (rubbing) alcohol. Draw a pencil line next to the crack, about 1/16 inch from the edges. Using a portable blow dryer on the hot setting (do not a heat gun), heat the surface on each side of the crack for about 20 minutes or until the crack closes up and disappears. The pencil mark should still be visible. Lay a thin bead of cyanoacrylate glue (you can use popular brand-name products like Krazy Glue or Super Glue, but it’s better to get an industrial grade, usually marked “CA”) right on top of the crack. Don’t work on the countertop or disturb the surface for at least 24 hours. During this period, the glue will wick into the crack and harden for a maximum-strength bond. Hand-sand the repair area with 220-grit abrasive sandpaper, then follow with 400-grit paper. Finally, buff the area with an ultra-fine grade (dark grey) Scotch Brite pad. Some prefer a different method than the 'super glue' method just described. Repairing cracks in a solid surface material with two-part epoxy filler can be faster, easier, and more permanent than using cyanoacrylate, especially when repairing wider cracks. This method was first developed when solid surface materials originally came to market. Clean out and de-grease the crack using denatured alcohol. Set out two separate beads of epoxy filler and hardener on a disposable surface, as much as you think you’ll need to fill the crack plus a little more. Mix paint and/or original material shavings into the bead of filler to match the tine of the countertop. MIx in the hardener to the filler to form the epoxy. Apply the epoxy to the crack, forcing it in with a craft stick. Rake off most of the excess with the long edge of the stick—leave the filler protruding slightly above the surface. Examine the patch. If it blends well enough with the surrounding surface, leave it alone for the moment. If the color isn’t quite right or is too solid to blend with the pattern, stipple on some paints in coordinating colors. Be patient; don’t overdo it. Step away to get the overall impression from a normal distance. Let the epoxy harden according to the manufacturer’s instructions. When the epoxy has hardened completely, begin the sanding sequence, starting with 120-grit paper and working up to 400-grit. Add some more paint flecks if you need to camouflage the patch. Ultra-fine Scotch Brite pads can also help in the last stages. Polish the entire top to remove scratches and get the patched crack to blend with the surrounding countertop.